The ancient Indians were not aware of the theory of relativity. But they were familiar with the concept of space and relative time. They believed that the duration of time changed from world to world and that our time was not the absolute. They distinguished between the cosmic time of the gods and the earthly time of ours. According to them, the gods were immortal, who lived longer and more intense lives. They were subject to a different time frame and had their own periods of activity and rest. These constituted their days and nights. When the highest Supreme Self was awake, they believed, He would expand outwardly and manifest his objective worlds, and when it was time for rest, He would withdraw into Himself and bring the worlds and the entire creation to a temporary halt. This is similar to the expansion and contraction of the material universe according to the modern theories of the origin of the universe. In Hinduism time is known as kala. Kala means both time and death. Time is personified as the god of death, Yama, because death is a limiting factor in human life. Kala as god of death determines how long a person should live upon earth. So death and time are associated together. An individual's time upon earth begins with his birth and ends with his death. However for the soul, there is no death. It has no time because it is without a beginning and without an end. The concept of time in Hinduism is based on our own experience of time as recurring and predictable phenomena measurable in terms of units such as days and nights, or months and years. Just as there is regularity to our days and nights, there is regularity to the days and nights of gods. This regularity is perceived as the Rta (rita) or the cosmic rhythm manifested by God. Rta is inherent in every aspect of creation. In the human body it is the biorhythm as well as the beat of the heart and the breath of the lungs. In the universe it is inherent in the configuration of the planetary bodies and their fixed movements. What protects this regularity of rhythm is Dharma, the eternal law, which is but an aspect of God Himself. Mentioned below are some important beliefs of Hinduism associated with time as an aspect of creation. Some of these beliefs are also common to Buddhism and Jainism. However, in Buddhism and Jainism there is no creator. Time is an aspect of this illusory world and it exists as long as we are subject to the process of becoming or change. 1. Hinduism perceives time as cyclical. This is based on our own experience of time in terms of days and nights. We see this cyclical pattern in days, weeks, months, years, seasons and yugas or epochs. So from this perspective, time is a never-ending cyclical process, which is both repetitive and exhaustive. In a sense it is limited. In another it is eternal. From a spiritual perspective, time exists when we are in a state of duality but disappears when we enter into the state of unity or samadhi. 2. Each time-cycle has three components, srishti, sthithi and laya. Srishthi means creation. Sthithi means continuation and laya means dissolution. Each time cycle begins with creation, continues for certain duration of time and then dissolves into nothingness. After a brief respite, the cycle begins all over again. These three aspects of time are under the control of the Trinity, Brahma, Vishnu and Siva. Brahma is responsible for creation, Vishnu for existence and Siva for dissolution. We can see the same divisions in a day also. Each day is created in the early hours, continues throughout the day and then finally dissolves into darkness. We can see the same pattern in life also, as childhood, adulthood and old age. 3. The Hindu calculation of time comes to us from sage Ganita who is mentioned in the Manusmriti and the Mahabharata. He calculated the duration of each cycle of creation in human years. He divided the cosmic time into Kalpas, which is a day and night in the time and space of Brahma. It is considered to be equal to 8.64 billion years (Vishnu Purana). Each Kalpa consists of two Artha Kalpas of 4.32 billion years each. They are the day and night of Brahman. Each Kalpa is further divided into 1000 maha yugas. Each maha yuga is again divided into four yugas, namely krita yuga, treat yuga, dvapara yuga and kali yuga. Their duration varies. Krita yuga the first in the series has the longest duration of 1.728 million years and kali yuga, which is the last and the current, has a duration of only 432000 years. The durations of other divisions are mentioned in the table at the bottom of this article. 4. The lifespan of Brahma is considered 100 Brahma years, which is known as Maha Kalpa or Parardha. It is equal to 311.04 trillion human years. 5. A day in the life of gods is equal to one year upon earth. It is divided into day and night. The day is known as uttarayana and the night as dakshinayana. They are equal to 180 days each. 6. In Hindu tradition there is another division of time called manvantara. A manavantara is the period during which the earth is ruled by a particular Manu, the father of man. The word 'man' comes from the Sanskrit word Manu. According to tradition, a new Manu manifests at the beginning of each manvantara to produce a new race of human beings. Each manvantara lasts for about 71 mahayugas or approximately 308 million years. In each manvantara along with Manu appear seven seers or rishis and one Indra. 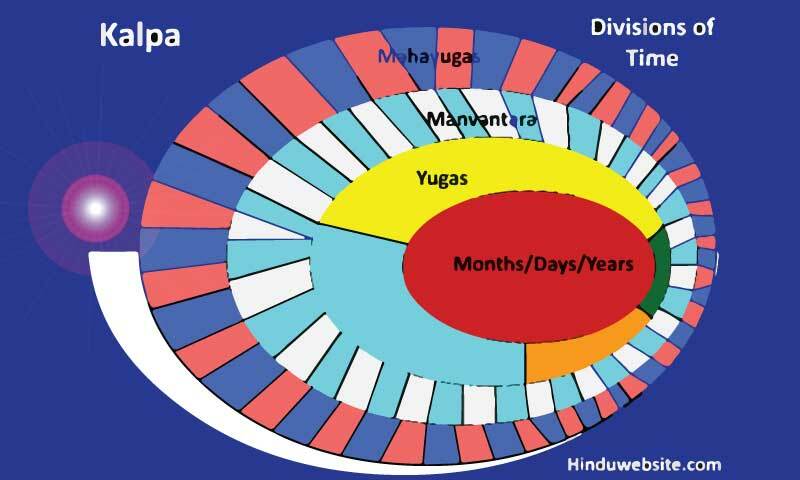 In all 14 Manus appear in each Kalpa over a period of 1000 mahayugas in succession. The current Manu is 7th in the line and is known as Vaivasvata Manu. 7. The current yuga or epoch is known as Kaliyuga. It is the last in the cycle of the current mahayuga or great epoch. Its calculated duration is 432000 years. We are not sure presently whether we are at the beginning, in the middle or near the end of Kaliyuga. If we accept the theory that Kaliyuga began with the passing away of Lord Krishna some 6000 or 7000 years ago, then probably we are in the early phase of Kaliyuga and have a long way to go. 8. Hindu Purunas contain several narrative accounts in which celestial events span over longer durations of time. They describe gods waging wars, or practicing meditation or making love for hundreds and thousands of years. Is Time Real Or Illusory? In Hinduism time is regarded as an aspect of creation. It exists only so long as we are bound to the things of this world through our senses. Time is a mental concept created by the movement of our senses, the celestial objects and our perceptions. It is part of the illusion in which we live and which we take for real. In God's consciousness there are no divisions of time. There is only the present moment, one continuous, indivisible and indistinguishable state of existence. Time is also regarded as an aspect of Prakriti or Nature. It is one of the 36 tattvas or principles of creation recognized in Saivism. Prakriti subjects the boundless individual souls of pure consciousness to the limitations of time (kaala), space (niyathi), knowledge (vidya), passion (raga) and power (kala) and binds them to the cycle of births and rebirths. When beings transcend these five limitations through the grace of Siva, they regain their pure consciousness (chit) and become free. The Hindu view time is responsible for absence of accurate historical records of the Indian subcontinent. The ancient Indians did not deem it necessary to record events of a world they believed was illusory. Besides, they believed the events by themselves were of no significance unless they had some relevance to the gods and the percepts of Dharma. Kali yuga 432000 years The current epoch, the age of darkness of one feet length. Manvantara 308 million years Manu is the progenitor of human race. Hindus also follow a 60 year cycle in which each year is given a specific name which repeat after every 60 years. According to Hindu mythology, there are 27 stars or nakshatras who are the daughters of either Daksha or Kashyapa, but wives of Chandra, the moon god. The moon god spends each night with one particular star, with whom he appears in the sky. According to Hindu astronomy, the sky is divided into 27 divisions. During its monthly cycle, the moon passes through each division roughly one per day. According to another tradition the 27 nakshatras are associated with the nine planets or navagrahas, with each planetary deity ruling over three particular stars. During the 27 day lunar cycle, the planetary gods enter into their respective star mansions and spend nine days with each of their three stars. The names of the 27 stars along with their controlling planets are mentioned below.